The Greenville Drive’s Playcation promotion has proven to be a huge hit in the Upstate since its founding in 2011. The Drive’s first playcation package of the 2014 season produced a sold out event on June 4th, including a Drive game attendance record of 7,176 fans. As a result of this early success, the Drive have been working with its Playcation partners to set another date for 2014. 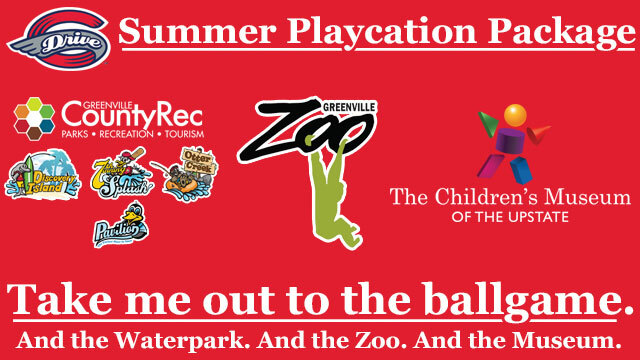 The Drive, along with The Children’s Museum of the Upstate, the Greenville Zoo and Greenville County Rec Waterparks and Pavilion, are pleased to announce that Wednesday, July 2nd will serve as the second date for the Playcation package in 2014. The package includes four tickets to the Greenville Drive’s game against the Asheville Tourists on Wednesday, July 2nd at 7:05, plus four passes to The Children’s Museum of the Upstate, the Greenville Zoo and Greenville County Rec Waterparks and Pavilion, for just $40, a savings of $100! The passes for the Upstate attractions can only be purchased from the Drive Box office and are valid from July 2nd through September 1st. The package must be purchased as a whole and all four tickets for the attractions must be used in one visit to each of the attractions. Act soon, because the Playcation package will sell quickly! To purchase the package, visit the Main Street Box Office at Fluor Field or call (864) 240-4528. At the time of purchase, fans will receive four Drive tickets plus a card that can be redeemed at any of the Upstate attraction locations starting on July 2nd.